A note arrives from Barbara Muller at Ocean Independence in Palma to say that the 33.5m motor yacht Daniella is now back in the charter fleet. Built by Lloyds Ships, she has accommodation for eight guests in three doubles and a twin cabin. An interior in contemporary fabrics combined with light oak wood joinery creates a relaxed, inviting ambience and each of her three decks is designed for carefree entertaining. Complete with two Seabobs, a state-of-the-art home cinema and all the toys, Daniella offers an unforgettable charter experience. 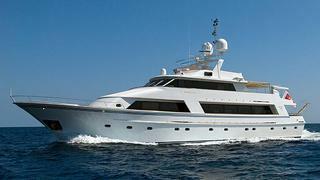 Weekly rates are €49,300 in high season and €44,200 in low season with no delivery fees for charters of over a week.